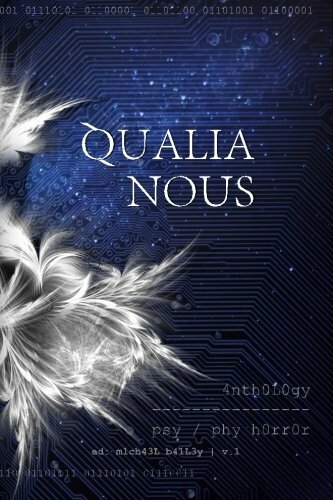 For fun, I’ve illustrated all of the stories and poems appearing in the anthology Qualia Nous. 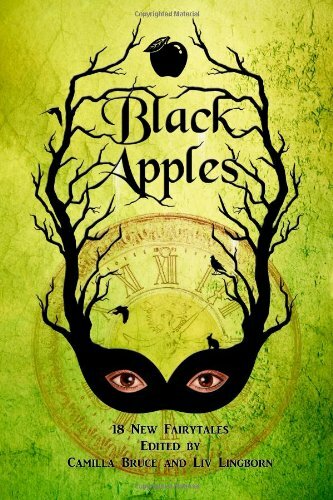 I wanted to thank the other authors for allowing me to have a story alongside them in this amazing anthology. Since I’m an artist too I thought what better gift than. . .
His potent heat, a shifting locus of limp time-space with infinite energy roiling inside it, touched her, making her recoil. Shake stopped short, surprised by the sight–a car he’d seen often in his dreams and would never forget, along with the animal-like screaming sirens. I leave her alone on my porch with the appendage I cannot keep, dust settling into her hair like flakes of gold leaf upon brittle paper. I stared at the Eiffel Tower around the bend of the river. From that distance it was easy to pretend it was still new, a shining gleaming symbol of possibility, instead of just a metal tower, vandalized with chewing gum and rusting against the night sky. The Angel dropped hit-and-run low, left the road and led the way across a field that broke violently upon them as though heaved from a bucket. He stared at her face, loving the sight of her, but a tiny shiver ran down his spine. He didn’t know why. Numerous gray nothing-beings walked through these doorways and sat on these benches. The ceiling seemed to stretch for miles. Everyone looked exactly the same. They barred the library door today. Alex, deliciously young Alex, hides in the tree. Her tree of life, his secret hideaway, where she giddily lies low while the others search for him. He could only stay there a moment or two before needing to step back and let the grill burn in peace. If he’d stay there any longer, he’d risk melting the plastic off his face. She is a transitory captive to her mirror, when even this display is not enough. Something is happening on the street. Everything went wrong after the crash. Tonight was different. Instead of watching, he strived to be waiting. He realized on his way to her house that for him . . . overnight, the game had changed. Wherever you went, you’d find Kilroy had been there before you. On the dust of the moon, the plains of Mars, even the ice fields of Europa–Kilroy had been there, he of the goofy big-nosed face. Have you ever been so sad and missed someone so badly that you thought your heart would surely stop? And yet it never does? The reflected landscape had been destroyed; she recognized it now–the warring city. Charred bodies and remains of an exploded bus littered the road. We are breathing you in, consuming you, taking our fill, even as we recreate you in our image. We practiced. Becoming nothing, returning with a new sense of what peace might mean. Posted on November 9, 2014, in Art, Fiction and tagged creative commons, illustration, literary horror, photo manipulation, Photoshop, Qualia Nous, science fiction, Stephen King, Written Backwards. Bookmark the permalink. 1 Comment.